(Lanka-e-News - 27.Nov.2017, 6.15PM) Minister Dayasiri Jayasekera had to admit at the last cabinet meeting that the ban imposed on Lanka e News prohibiting its viewers to access it within Sri Lanka is illegal, while Minster Rajitha Senaratne was remaining silent. 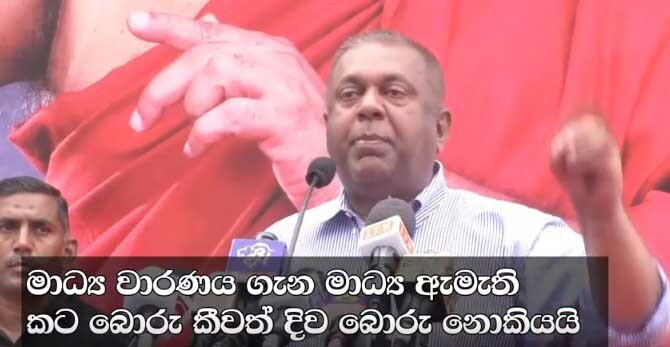 When a satyagraha was staged in Matara recently ‘On behalf of 6.2 million’ , the minister of media who was reticent in the above connection , however made a statement . Though he uttered a lie his tongue as though cannot be controlled betrayed the truth. When he should say , the law and justice must override and prevail over the president , prime minister and minister , what escaped from his mouth was , that is not happening .The current media minister Mangala Samaraweera who espoused the cause of media freedom and spoke loudly on its behalf when he was in the opposition tried to show , ‘Editor’s lack of knowledge ‘ was responsible for this illegal media ban.